Pretty warm day here in San Diego, so why not crack into a stout? This one came with the last of my craft beer club shipments. I'd avoided it for a while because it's summer and stouts aren't generally summery kinds of beer. But then I looked a bit closer at the label and saw the words 'vanilla beans'. Into my belly it goes. They call this one 'Oak Barrel Stout'. But on the back of the label and on the website, it says it's 'dry-hopped' with oak...chips. I know 'Oak Chip Stout' doesn't quite have the same ring, but 'Oak Barrel Stout' is a bit misleading. The bottle's a twist-off, which is only noteworthy because I'm not sure I'm aware of any other stouts that come in twist-offs. The color's nice and stouty, dark and opaque. 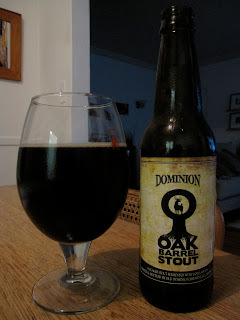 The vanilla's there on the nose along with the usual roasted malt aromas, but it's pretty light...I guess that shouldn't be surprising, since this isn't called a Vanilla Oak Barrel Stout. There's a touch of smoke, but the oak comes through stronger as an actual wood smell, which is interesting. The flavor's more complex than I would've expected, but not all of the complexity is beneficial. The roasted malt is of course there, while the vanilla only really comes out once the beer's warmed a bit, and even then it's pretty meek. The oak is pretty unique, in that it brings some woodsy flavor (no way in hell I'm going to call it woody flavor with this crowd), but also a dry mouthfeel, like it does with wine and whisky. There's also an odd sourness, a vinegary sort of thing that I'm not sure I like, and I don't know if it's from the oak or something else. It kind of drags the beer down a bit because none of the other flavors are potent enough to hide it. All in all not bad, especially because it's presumably cheap since it came from the craft beer club. I'd like it more if they doubled the vanilla influence, because as it currently stands it feels like it's lacking something, and I don't think adding more oak would help. So maybe it's good that it's not actually a true Oak Barrel Stout.